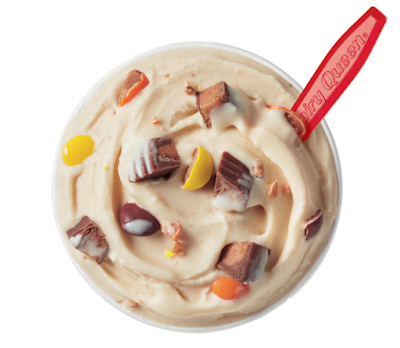 Dairy Queen whips up the new Reese's Outrageous Blizzard as the August 2018 Blizzard of the Month. Available for a limited-time, the new Blizzard features Reese's Peanut Butter Cups, Reese's Pieces, peanut butter, and caramel blended with vanilla soft serve ice cream. It's inspired by the Reese's Outrageous candy bar, which also inspired a new Krispy Kreme donut, and consists of a peanut butter core surrounded with caramel and mini Reese's pieces, covered with milk chocolate. Dairy Queen also continues to offer the limited-time Summer Blizzard Menu, which includes Jurassic Chomp, Summer Berry Cheesecake, Twix, Cotton Candy, and S'more Blizzards.